For his cousin, the English footballer, see Steven Sessegnon. Stéphane Sessègnon (born 1 June 1984) is a Beninese footballer who plays for Turkish club Gençlerbirliği. He is a Benin international having starred for the nation at both the 2008 and 2010 editions of the Africa Cup of Nations. Sessègnon plays a variety of positions as a forward, a winger and as a midfield playmaker. Sessègnon began his career in Cotonou with Benin Premier League side Requins de l'Atlantique, which means the Sharks of the Atlantic in French. After spending only a year in the club's senior team, he moved to France to join Créteil, based in the Parisian suburbs, where he joined fellow international Noël Séka. Sessègnon made his debut on the opening match day of the 2004–05 Ligue 2 season against Stade Reims as a substitute in a 2–1 defeat. He scored his first goals on 14 January 2005, a brace in a span of four minutes, in a 3–0 win over Gueugnon. Though Créteil finished in 15th position, Sessègnon was labeled a revelation as he was the primary bright spot in helping the club escape relegation. Keen on a move to Ligue 1, Sessègnon signed a three-year deal with Le Mans on 19 May 2006. He made his debut for the club in a league match against Troyes, appearing as a substitute in a 2–2 draw. After featuring as a substitute in his first five appearances, and receiving a straight red card in a match against Sedan, he earned his first start on 4 November 2006 against Auxerre. Two weeks later, he scored his first career goal for Le Mans in a 1–1 draw with Rennes. Initially used as a holding midfielder at Le Mans, Sessègnon was given a more advanced role for the 2007–08 season, often starting on the right side of the midfield or as an attacker. In this new role, he scored both goals in the club's 3–2 defeat to giants Lyon on 1 September 2007. He scored again the following week in a 1–0 victory over Valenciennes. Sessègnon also helped the club reach the semi-finals of the Coupe de la Ligue that season although they lost to Lens in a thrilling 5–4 defeat in extra time, Sessègnon playing the entire 120 minutes. Sessègnon playing a match for PSG against Nice. Due to his success at Le Mans, Sessègnon was scouted by larger clubs such as Premier League sides Arsenal and Newcastle United. However, he remained in France by signing a four-year deal with Paris Saint Germain. The fee was said to be in the range of €8–10 million. Sessègnon made his league debut with the club on 16 August 2008, starting in the 1–0 win against Bordeaux. The following match day, he scored his first goal for PSG in a 1–1 draw with Sochaux. On 13 December 2008, Sessègnon scored his third career brace against Auxerre in a 2–1 victory. For his positive performances, he was named the UNFP Player of the Month for December. Sessègnon also appeared in nine matches in the UEFA Cup, scoring one goal against Dutch club Twente. Several clubs contacted PSG in the off-season to discuss Sessègnon's availability, with Premier League clubs Chelsea, Liverpool, Arsenal, Everton and Manchester City being the primary suitors. Taking advantage of the considerable interest in him, Sessègnon issued a public demand on 23 June that his parent club give him a pay raise, stating, "I think I am one of the best performers in the club." The firing of PSG manager Paul Le Guen also played a role in his demands, and two weeks later, Sessègnon and the club reached an agreement on a contract extension with the player set to receive a substantial pay raise. In the 2010–11 season, Sessègnon struggled to make an impact with the first team after manager Antoine Kombouaré relegated him to a substitute's role. Friction between player and manager reached its zenith in December 2010, when Sessègnon accused Kombouaré of insulting him during a one-on-one interview ahead of the team's match against Nancy on 19 December. Sessègnon subsequently confirmed his desire to leave the club in the January window and, as a sign of his intent, refused to join Paris Saint-Germain on its winter training camp in Morocco. Sessègnon playing for Sunderland in 2011. On 29 January 2011, Sessègnon departed Paris Saint-Germain to join English club Sunderland. He signed a three-and-a-half-year contract and the transfer fee was priced at £6 million, and made his debut on 1 February against Chelsea. He made his second start for the Black Cats in 3–2 away loss against Stoke City on 5 February 2011. His first real successful moment as a Sunderland player after a disappointing start came on 23 April, where he scored his first goal for the club in the 4–2 win over Wigan Athletic. He converted a penalty of his own making in the 73rd minute, beating Ali Al-Habsi after being tripped by Antolín Alcaraz. Sessègnon had been forced to play in an unfamiliar role as a lone striker, after injuries to strikers Danny Welbeck and Asamoah Gyan during the match. Sessègnon scored in Sunderland's home defeat against Wolverhampton Wanderers, and again in the final match of the season, a 0–3 win at West Ham United. In his second season at Sunderland, Sessègnon scored his first goal of the season against Bolton Wanderers on 22 October 2011. He followed this up with an 89th-minute equaliser against Aston Villa a week later, also providing an assist and winning man of the match. On 8 February 2012, in a FA Cup fourth round replay, Sessègnon scored a dramatic late winner against Middlesbrough in the 113th minute during extra time to take Sunderland into the fifth round again Arsenal. On 4 March, he was sent-off in the match against Newcastle United for an elbow to the chest of Cheick Tioté, with Sunderland leading the Tyne-Wear derby 1–0. Newcastle went on to equalise in stoppage time. Sessègnon served a three-match ban returning to score the third goal in Sunderland's 3–1 win against Queens Park Rangers at the Stadium of Light on 24 March. Against Manchester City, although he did not score in the match, he set up two assists, one for a Sebastian Larsson opener in the 31st minute and the second for a Nicklas Bendtner header deep in the first half of injury time to make the match 2–1 for Sunderland at half time. The match finished in a 3–3 draw, with Larsson in the 55th minute scoring to put Sunderland 3–1 ahead after Sessègnon started that attack, then in the 85th minute, Mario Balotelli scored to make the score 3–2 and Aleksandar Kolarov scored Manchester City's equalising goal in the 86th. Sessègnon won the Player of the Season award for the season. On 30 August 2012, Sessègnon signed a new contract that would keep him at the Stadium of Light until 2015. In Paolo Di Canio's second match as Sunderland manager, on 14 April 2013, Sessègnon scored against Sunderland's fiercest rivals Newcastle to put Sunderland 1–0 up. Sunderland went on to win the encounter with their rivals 3–0, with Sessègnon assisting David Vaughan for the third goal. The following week, Sessègnon scored the only goal as Sunderland defeated Everton 1–0 at home. His season ended prematurely after he was sent off during Sunderland's 6–1 defeat against Aston Villa. On 2 September 2013, Sessègnon joined West Bromwich Albion for a club record fee of £5.5 million, rising to £6 million with extras. 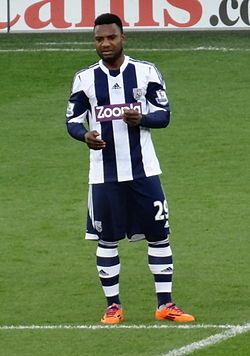 On 21 September, Sessègnon scored the first goal in a 3–0 win on his debut for West Bromwich Albion against Sunderland, his previous club. On 9 November, he scored against Chelsea in controversial 2–2 draw at Stamford Bridge. On 15 March 2014, Sessegnon scored the first Albion goal of a 1–2 away victory against Swansea City at the Liberty Stadium, helping Pepe Mel gain his first win as head coach. Sessègnon, thus far, has been a fan favourite at the club and his substitution in matches has often lead to a negative reaction from the fans. He scored his first goal of his second season at the club against Manchester United with a well-taken strike in a 2–2 draw at The Hawthorns. After almost leaving the club at the end of the season after falling out with manager Tony Pulis over selection issues, Sessegnon would return to the first team in the 2015–16 season with consistent performances. On 18 May 2016, it was announced that Sessègnon and Victor Anichebe would leave the club. On 26 September 2016, Sessègnon signed for Ligue 1 side Montpellier on a two-year deal. On 23 January 2018, Sessègnon signed a one and a half-year contract with Süper Lig side Gençlerbirliği. Sessègnon made his debut for Benin on 6 June 2004 in a 2006 World Cup qualification match against Cameroon starting in the team's 2–1 loss. Upon signing for Sunderland, manager Steve Bruce described Sessègnon as a player who "can play on the left, on the right, through the middle – he's lightning quick and he's a match-winner." Bruce also went on to say, "Stéphane's a little powerhouse with a low centre of gravity, some great dribbling skills and a good shot." He is a distant cousin of twin brothers Ryan and Steven, who both currently play for Fulham. Scores and results list Benin's goal tally first. ^ "Premier League Clubs submit Squad Lists" (PDF). Premier League. 1 February 2013. p. 31. Archived from the original (PDF) on 4 March 2016. Retrieved 24 June 2013. ^ "Stephane Sessegnon Player Profile". ESPN. Retrieved 7 May 2018. ^ "Reims v. Creteil Match Report". Ligue de Football Professionnel. 6 August 2004. Archived from the original on 4 August 2012. Retrieved 29 June 2010. ^ "Creteil v. Gueugnon Match Report". Ligue de Football Professionnel. 14 January 2005. Archived from the original on 4 September 2012. Retrieved 29 June 2010. ^ "Sessègnon, la révélation de Créteil". 20 Minutes. 22 March 2005. Archived from the original on 18 July 2012. Retrieved 29 June 2010. ^ "Le Mans v. Troyes Match Report". Ligue de Football Professionnel. 12 August 2006. Archived from the original on 18 March 2007. Retrieved 29 June 2010. ^ "Sedan v. Le Mans Match Report". Ligue de Football Professionnel. 16 September 2006. Archived from the original on 18 March 2007. Retrieved 29 June 2010. ^ "Auxerre v. Le Mans Match Report". Ligue de Football Professionnel. 4 November 2006. Archived from the original on 26 March 2009. Retrieved 29 June 2010. ^ "Rennes v. Le Mans Match Report". Ligue de Football Professionnel. 18 November 2006. Archived from the original on 18 March 2007. Retrieved 29 June 2010. ^ "Le Mans v. Lyon Match Report". Ligue de Football Professionnel. 1 September 2007. Archived from the original on 8 December 2007. Retrieved 29 June 2010. ^ "Le Mans v. Valenciennes Match Report". Ligue de Football Professionnel. 8 September 2007. Archived from the original on 4 August 2012. Retrieved 29 June 2010. ^ "Le Mans v. Lens Match Report". Ligue de Football Professionnel. 27 February 2008. Archived from the original on 3 September 2012. Retrieved 29 June 2010. ^ Arsenal, Newcastle maintain Sessegnon interest. tribalfootball.com. 6 June 2008. ^ "PSG: Sessegnon arrive". Mercato 365. 10 July 2008. Archived from the original on 17 April 2009. Retrieved 29 June 2010. ^ "PSG sign midfielder Sessègnon". MSN. 11 July 2008. Retrieved 29 June 2010. ^ "PSG v. Bordeaux Match Report". Ligue de Football Professionnel. 16 August 2008. Archived from the original on 25 April 2009. Retrieved 29 June 2010. ^ "Sochaux v. PSG Match Report". Ligue de Football Professionnel. 23 August 2008. Archived from the original on 6 November 2009. Retrieved 29 June 2010. ^ "Auxerre v. PSG Match Report". Ligue de Football Professionnel. 13 December 2008. Archived from the original on 20 April 2009. Retrieved 29 June 2010. ^ "Sessègnon, la confirmation!". UNFP. 29 December 2008. Retrieved 29 June 2010. ^ "Twente made to feel the PSG force". UEFA. 18 December 2008. Archived from the original on 16 January 2016. Retrieved 29 June 2010. ^ Man City, Chelsea and Everton alerted by breakdown in Sessègnon contract talks Archived 27 June 2009 at the Wayback Machine. Footylatest.com. 23 June 2009. Retrieved 6 July 2012. ^ "Sessegnon open to Chelsea offer". FIFA. 24 April 2009. Retrieved 29 June 2010. ^ "Liverpool To Battle Chelsea for Talented £12m Playmaker". FIFA. 31 May 2009. Archived from the original on 28 June 2010. Retrieved 29 June 2010. ^ "Arsenal Set To Beat Chelsea For Sessègnon". MTN Football. 14 April 2009. Archived from the original on 11 August 2011. Retrieved 29 June 2010. ^ "Man City, Chelsea and Everton alerted by breakdown in Sessègnon contract talks". Footy Latest. 23 June 2009. Archived from the original on 27 June 2009. Retrieved 29 June 2010. ^ "Sessègnon wants new deal". Sky Sports. 23 June 2009. Retrieved 29 June 2010. ^ "Sessègnon signs PSG extension". Sky Sports. 7 July 2009. Retrieved 29 June 2010. ^ "Sessègnon: "Kombouaré m'a insulté"". Yahoo Sports!. 23 December 2010. Archived from the original on 27 December 2010. Retrieved 27 January 2011. ^ "Sessègnon left at home whilst Deschamps wants security". A Different League. 8 January 2011. Archived from the original on 12 January 2011. Retrieved 27 January 2011. ^ "Stéphane Sessègnon à Sunderland". A Different League (in German). 29 January 2011. Retrieved 29 January 2011. ^ "Sunderland sign Stéphane Sessègnon for £6m and Sulley Muntari on loan". Guardian Media Group. London. 29 January 2011. Retrieved 29 January 2011. ^ Saj Chowdhury (1 February 2011). "Sunderland 2–4 Chelsea". BBC Sport. Retrieved 2 February 2011. ^ Mark Ashenden (5 February 2011). "Stoke 3 – 2 Sunderland". BBC Sport. Retrieved 5 February 2011. ^ Angus Lovely (22 April 2011). "Sunderland 4–2 Wigan Athletic". BBC Sport. Retrieved 22 April 2011. ^ "Sunderland 1–3 Wolves". BBC News. 14 May 2011. ^ "West Ham United 0–3 Sunderland: Zenden, Sessegnon & Riveros goals send Hammers down with a whimper". Goal.com. 22 May 2011. Retrieved 6 July 2012. ^ BBC Sport – Middlesbrough 1–2 Sunderland. BBC. 7 February 2012. Retrieved 6 July 2012. ^ "Sunderland's Lee Cattermole and Stéphane Sessègnon to miss Everton tie". The Guardian. 6 March 2012. Retrieved 23 April 2012. ^ "City sidestep Sunderland upset". 31 March 2012. Retrieved 1 September 2017. ^ "Pair take top awards". Sunderland A.F.C. 10 May 2012. Retrieved 10 May 2012. ^ "Sessegnon signs new deal". SAFC Sport. Retrieved 30 August 2012. ^ "Aston Villa F.C vs Sunderland A.F.C." BBC Sport. Retrieved 29 April 2013. ^ "West Brom break record for Stephane Sessegnon". Retrieved 2 September 2013. ^ Ashton, Becky (21 September 2013). "West Brom 3–0 Sunderland". BBC Sport. Retrieved 24 September 2013. ^ Sheringham, Sam (9 November 2013). "Chelsea 2–2 West Bromwich Albion". BBC Sport. Retrieved 19 March 2014. ^ Westall, Rob (15 March 2014). "Swansea City 1–2 West Bromwich Albion". BBC Sport. Retrieved 19 March 2014. ^ "Alan Irvine responds to criticism at West Brom". Express & Star. ^ Winter, Henry (20 October 2014). "West Bromwich Albion 2 Manchester United 2: Daley Blind and Marouane Fellaini save point for Louis van Gaal" – via The Daily Telegraph. ^ "Stephane Sessegnon closer to Albion exit". Express & Star. ^ Kendrick, Mat (18 December 2015). "Tony Pulis: Stéphane Sessègnon set for West Brom return against Bournemouth". ^ "Fletcher: Saido Berahino must follow Stephane Sessegnon's example". ^ "Albion confirm Hawthorns departures". West Bromwich Albion F.C. 18 May 2016. ^ "Sessegnon à Montpellier (off.)". sport24.fr. 26 September 2016. ^ "YENİ TRANSFERİMİZ STEPHANE SESSEGNON" (in Turkish). Gençlerbirliği S.K. 28 January 2018. ^ "Cameroon – Benin Match Report". FIFA. 6 June 2004. Archived from the original on 13 October 2009. Retrieved 29 June 2010. ^ "Bruce on Sessègnon capture". Sunderland A.F.C. 29 January 2011. Retrieved 2 February 2011. ^ "Stephane Sessegnon". Soccerbase. Retrieved 30 December 2015. ^ a b "Sessègnon, Stéphane". National-Football-Teams. Retrieved 30 December 2015. Wikimedia Commons has media related to Stéphane Sessègnon. This page was last edited on 18 February 2019, at 06:07 (UTC).